Pictured above is Abby, a Rotterman. 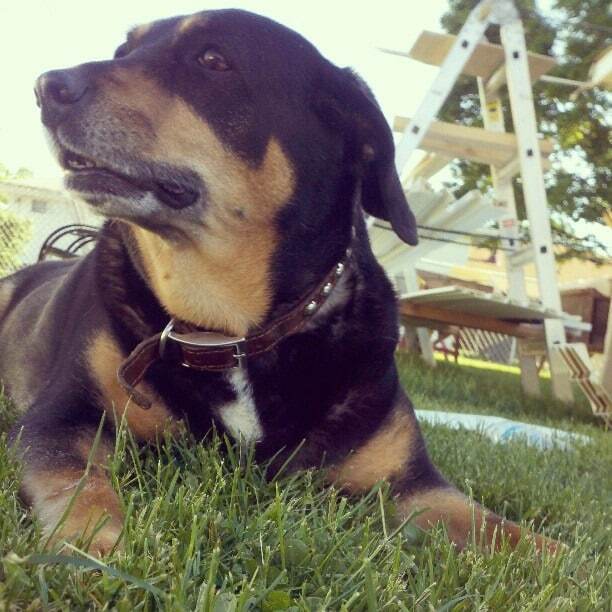 Taken by her owner, MaKayla Motz. The Rotterman dog is a Rottweiler and Doberman mix, a dog that seems to be designed both as a guard and as a family member. There are a number of characteristics that are common for both breeds that form the Rotterman hybrid. One of them is that they’re both guard dogs, another is that they have short hair that doesn’t require a lot of maintenance. The weight is close enough as well. Overall, these two breeds are quite similar in the way they look and behave, so as far as the temperament goes, you’re getting dogs that are almost predictable. Since you’re getting a mixed dog, you usually don’t have any guarantee that there aren’t other breeds mixed somewhere in there. You might have a dog that is not only Doberman and Rottweiler, but also a bit of German Shepherd, and you might not have any idea. 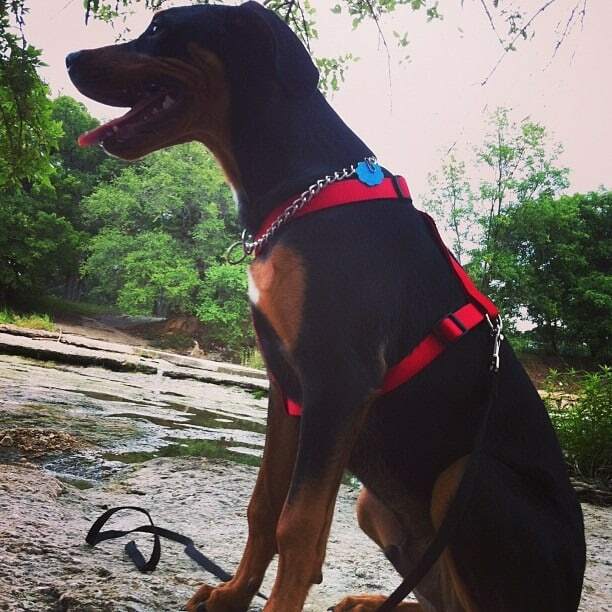 Keep reading to learn about the Doberman Rottweiler mix, the hybrid dog known as a Rotterman. Rottweiler is a breed of working dog, probably descended from a herding dog used by the Roman armies to drive their cattle and to guard their camps. The breed, revived early in the 20th century and used for police work, was recognized in the U.S. in 1931. Rottweilers are fairly large, strongly built, and intelligent, making excellent guard dogs. The short, coarse, flat hair is black, with tan to dark brown markings. The tail is short and carried horizontally. Males stand about 24 to 27 in. and females about 22 to 26 in. The weight ranges from 80 – 110 lb, which means that if your Rotterman takes from the Rottweiler side of the family, it could be quite a large dog. The Rottweiler makes a wonderful companion, often following their family members from room to room in the home. When introduced at a young age they are very gentle and loving to children and good with other animals. Because of its size and strength, it is imperative that they receive proper socialization and obedience training from an early age. A Doberman is considered first of all a guard dog, bred to be fast to act, intimidating and quite ferocious. Though designed to be guard dogs first, they can be very loyal and kind, great additions to any family that is looking for a pet. They do need a bit of exercise on a daily basis. The Doberman was created by a tax collector called Louis Dobermann at the end of the 19th century, as a protection dog during his daily duties. Both the Doberman and the Rottweiler are German dogs. The male Doberman can reach a height of 71 cm (28 inches) and a 41 kg (90 pounds) weight. As for the female, you can expect a height of 61 cm (24 inches) and weight of 30 kg (66 pounds). If the Rotterman will take its coat from the Doberman you can expect it to be thick and short, smooth and kept closely to the body. It doesn’t require a lot of grooming. Check out below a picture with an adult Rotterman and that of a puppy Doberman Rottweiler mix. Hi, my family and i own a 6 month pure breed rottweiler name rocky. We Brought him from a breeder when he was 8 weeks, he is very well behaved and loves our kids. Ages 1,3,4,7. We live in apartment and im a stay home mom so my rocky has all the attention he needs. I recently seen a rotterman up for sale online and i really want to buy one. But after my research i came across that a rotterman is not suited for a aprtment life. Would it be a good idea to get a rotterman? Will he be abel to adapt? I have only owned male dogs. Would it be a good idea to own a male pure breed rottweiler (6 months) and a 1 month old rrotterman? Rotterman are very active, mine drive ms me crazy ! I own a rotterman and I haven’t seen him sitting silently at one place . Rotterman’s are wonderful dogs. My girlfriend and I adopted a Rotterman puppy which was abandoned in the woods near a hotel in Romania. They are loyal, loving and great companions. They will take as much exercise as you want to give them and are willing to calmly lie in bed and watch movies if this is what their owner desires. Our puppy grew up with cats and while she loves chasing them for play outdoors, once indoors, she and the cat sleep, groom and cuddle each other. Best dog ever! I had a rotterman from 4 weeks old ( had k9 teeth already mother wouldn’t feed him any longer) til he was 6 months ( LOKI ) then he was stolen !! 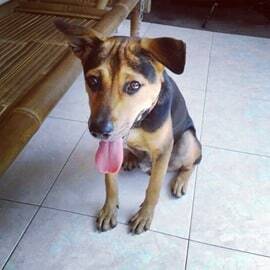 He was the perpact dog very obedient very loving just the best dog I can never have very good looking too. I’m in search of another as close as I can get to My Loki , I just wanted to say if your looking for a very well manered behaved, loyal trust worthy dog this is the one, what I wouknd give to have my Loki back , he would be 6 this year he was born on Valentines day of 2010 , stop thinking about this mix breed and just get one for yourself you won’t regret it !! Kelly Davis of Colorado U.S.A.
Hello! My girlfriend and I adopted a Rotterman yesterday. He’s 1 month old. The first few hours he was very shy and he was not moving from the place where we would put him. A few hours later he got very active and not shy at all. The thing that we are trying to deal with is that he wants in the bed when we go to sleep. If we don’t pick him up he will cry and cry. What should we do about that? We made him a nice comfy bed right next to our bed, but he’s not even look at. Once we pick him up he will start chewing the blankets and everything that he caught. Also when hes down on the floor he chews absolutely everything. What’s the easiest way to deal with him, now as a puppy? Thank you! And I’m sorry for my broken english. Hello – we just lost our rottetman mollie to cancer last week . What we all wouldn’t do to spend just one more day with her. She is greatly missed ! Mollie had the best temperment of any dog I have ever personally known and was a very behaving dog . She took everyone under her wing ; puppies , children elderly folks etc. Mollie should have been a therapy dog becouse she was loving and knew exactly how to make everything ok . Rottermans are a mixed breed and hard to come by. Our mollie was a rescue, so FYI if you are lucky enough to be blessed with this type of dog , cherish them they will truly be your best friend ! We have a 9 month old Rotterman named Scout. He is ACK puppy kindergarten trained, socialized with people and other dogs, house broken, fixed, crate trained and walks on a leash well. He is sweet and loveable. However, we have our plate full. My husband is in the military and is gone a lot so I’m the primary caretaker. If I didn’t have a three year old toddler, a one year old baby, a twelve year old tween and another dog, I wouldn’t consider rehoming him. But it’s simply too much and he deserves more attention. Although he is pretty independent and does well alone for extended periods of time, like a full day at work, he loves being part of the pack. Are you, or anyone you know, interested in taking in this gorgeous dog? I couldn’t bare the thought of this dog going anywhere other than a loving home. Can you send me pictures… Where is it located? Is it up to date with vaccines and neutered etc. Please send me info.